Three words that best describe Alen are: Creative, Motivated, Loyal. Alen knew he had a passion for hair and make-up by the age of 12. 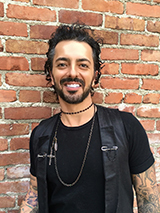 His education at Vidal Sassoon, Tony And Guy, Aveda Academies provided him with a solid foundation for his career. He has been inspired by hair and make-up artists who have guided his imagination and skills to create outstanding results. Alen’s precision cutting techniques aim to tailor looks that add to each guest’s personal beauty. His extensive experience in color provides him with the skills to create the most beautiful natural tones and deep, rich and vibrant colors for his guests. His love for transformation doesn’t end with hair color, cut, hair extensions, and style. Whether it is freehand or airbrush makeup, from natural to elegant or edgy, he creates looks for any occasion. During his career, the art of hair extensions that look and feel as natural as your own hair was added to his repertoire. His involvement in photo shoots, fashion shows and special events gave him the opportunity to expand his experience’s limitless styles. Leaving Alen’s chair you will feel rejuvenated, refreshed and a new person. His personal approach to his guests and the salon’s team makes him lively, creative, and the professional person that he is. This is not a job for Alen. It is his life and passion.